Now that some stores already have their Christmas decorations up, its really hit home to me that Christmas is TEN WEEKS away (*Slight hysteria*) and I absolutely can’t rush through a shopping mall on the morning of the 24th AGAIN.. My teenage nephews pose a particular problem but I think I’ve found the solution at The Present Finder which specialises in unusual and unique presents, which have been designed to bring excitement to any sullen teenage boy. The Science Museum's Solar Airship doesn't need gas, pumps and no puffing required! From box to air in under two minutes, this giant craft (8 metres long!!) 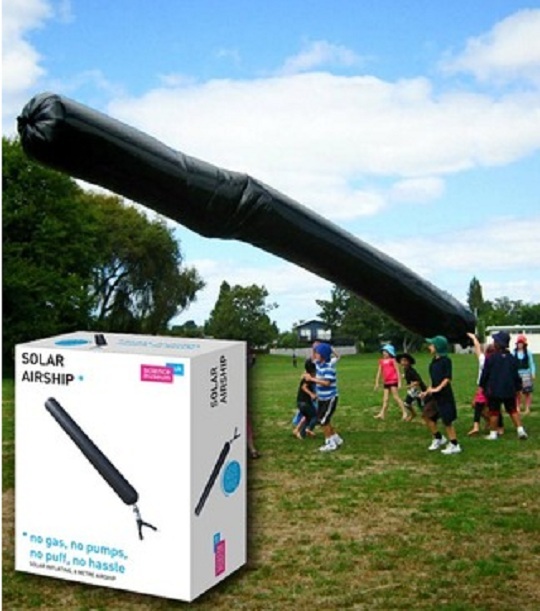 inflates and flies using solar power alone. Just hold the airship’s tube and take a little jog to fill it with air. The heat absorbent material that the airship is made of causes the air inside to warm and expand and within minutes, this giant sausage shaped kite will be airborne, even on those particularly grey days. Just remember to attach the 50 metre cord provided and hey presto, you're in control of your own UFO!